If you are a landscaping enthusiast, then you are probably on the lookout for some of the best tools to support your interest. A pole saw makes up for the height challenge to reach that overhanging branch blocking your morning window view of the lilies in your garden. It saves you from so much straining and stretching ensuring your landscaping is effortless. In this guide, we will review the best pole saws available for purchase today. 2 What is a Pole Saw and why are they Important? 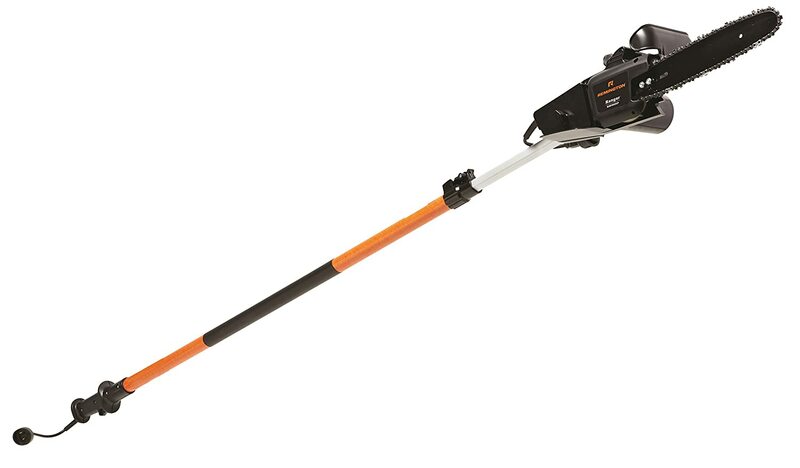 This is a battery-powered pole saw that comes with a powerful lithium-ion battery. Its bar is 8 inches long to make branch trimming pretty easy. And at 8lbs, the pole saw is lightweight to lift over your head. The tension system is quite easy to adjust when tightening the chain. To further make your pruning task more manageable, the pole saw comes with an automatic oiler. This pole saw is for the people looking for an extra-long pole saw to reach higher – it can reach 14 feet. The gardening tool employs a power-lever technology to make it more efficient than its peers. There is a steel pruner explicitly dealing with the branches, and a woodzig saw for those large branches in a tree. The poles are ergonomically shaped to fit the shape of your hand allowing you to control the direction of the cut. And to ensure the extendable pole stays secure, it has a double-locking system. This product is ideal for dealing with the overhanging limbs and branches you need out of the way. And to ensure you reach some of the furthest branches, the telescoping pole is extendable to 15 feet. 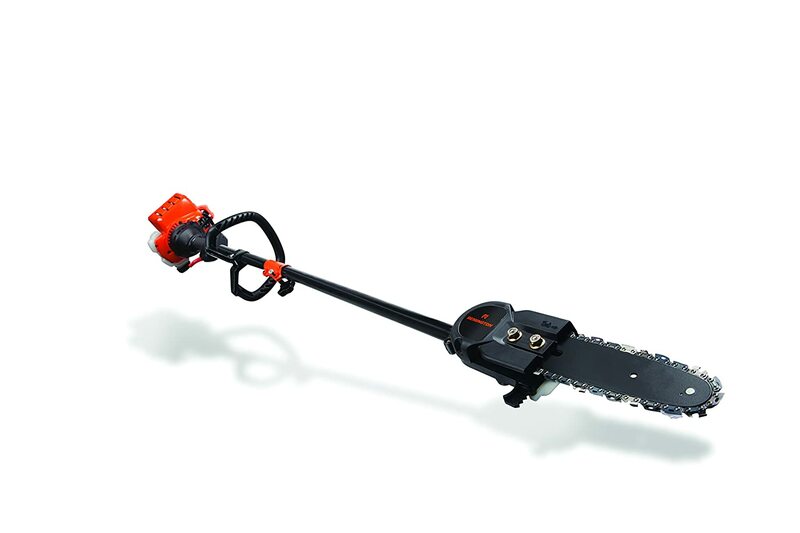 Its powerful motor can cut branches more than 7.5-inches thick. The cutting bar is 8 inches, sufficient for dealing with thick branches. Has automatic lubrication that maintains the chain. The pole saw has no associated emissions and noise pollution. 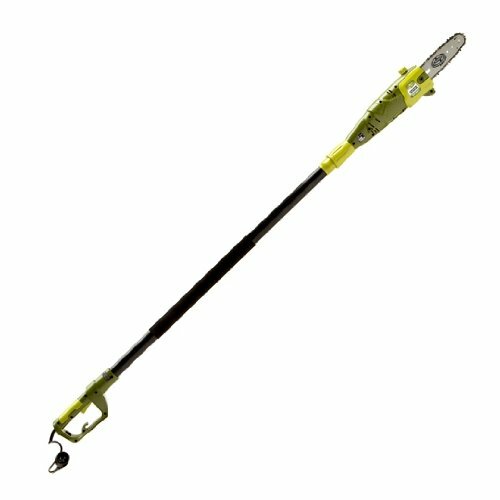 This is an 8-inch bar gas pole saw with sufficient power to cut through most branches. It also has a powerful 25cc engine adequate to handle difficult pruning and branch cutting. The gas pole saw comes with a 7ft extension pole allowing a total reach of 12ft. And to ensure proper lubrication of the chain, the pole saw has an auto oiler. It is a two-in-one detachable pole that reaches those hard to reach branches. The pole comes with an efficient 8 amp electric motor with reduced kickbacks. It can reach up to 15ft up the branch. And to ensure the pole stays stable, it has a flip-and-lock clamp. The saw also has a non-slip handle to provide a comfortable use. What is a Pole Saw and why are they Important? These are multifunctional gardening tools that are mainly small chainsaws embedded to a pole to lengthen your reach. Pole saws are ideal for cutting logs, branches, limbing and pruning. The good thing about these tools is that they have an extended range. This saves you from having to scale a ladder risking injuries from accidental falling. You will find models with poles as long as 15 feet that make pruning easy and so much fun – there is nothing as fun to the gardener as seeing everything fall into place. These tools also make cutting into logs an easy task – swinging and tapping with a kukri garden machete will be a thing of the past. With a pole saw, you are far much efficient and quick in your gardening tasks. You are even more efficient than a person using a handsaw or other manual tool. Finding pole saws with two-piece shafts for convenience is possible. If you need to reach far away branches, you will just join the shafts and go ahead. Disassembling to a shorter size allows for a close-up gardening activity. Most of these tools are well-balanced and will negotiate tight spots when pruning. However, you have to expect some weight as having a mini chainsaw at the end is no mean feat. Most of them are made of light fiberglass or aluminum making them easy to lift and use in large property area. Some models easily accept other gardening tools attachment, so you end up with a truly versatile pole saw. You can have an edger or hedge trimmer all in one. The first feature to look out for is the length of the pole saw. Ideally, the length should at least be eight inches. Anything shorter than this is nothing but underwhelming. Ten inches on a powerful machine is desirable but don’t let it be too long. It could compromise maneuverability. The length of the extension pole should be between 6 and 7 feet long at the very least. Should you find longer, then determine whether you can handle it comfortably. You apparently have realized over the years that even the most light of equipment become heavy when you hold them up high. Therefore, consider the weight of pole saw before checking out. The best pole saw packs a host of safety features to your benefit. Don’t just seek out for one safety feature. After all, coming out of the gardening exercise in one piece is more important than anything else. As with any other products in the market, there are various types of pole saws, and your choice depends on preference and function. The Corded Version: these are electric-powered and require an electric outlet to function. Apart from the cord that may seem to limit, the electric-powered pole saws are cleaner and efficient. There are no intrusive and polluting fumes and staining oil spills you need to deal with.These pole saws are a walk in the park when it comes to using them. All you need to do is plug them into a power source, and you are good to go. The controls and maintenance are not that hard to master. The Cordless Version/ Battery-powered: unlike their counterpart the electric-powered, the battery-powered is portable. You can easily carry them around a massive property pruning and clearing without worrying about a cord.Battery-powered pole saws are also ideal for outdoor lovers. You can bring it along on your next camping trip and make your camping or hiking easier.These pole saws need charging, and the majority of them come with a charger. To ensure you are not moving to and from charging it to complete a particular section, choose a model that comes with a lithium-ion battery. Gas-powered: these are other portable versions that you can easily carry from one end to the other without having to worry about a cord. These pole saw versions are quite efficient and pack a significant amount of power to cut through logs and thicket quickly.They are the heavy duty version of pole saw that might help you maintain a large property. They are the ultimate workhorses.Their shortcomings include the fumes they emit and the frequent maintenance needed. You will also need to keep checking the gas level. Gas-powered pole saws are a bit heavier than other models and may not sometimes be considered beginner-friendly. The best pole saw makes your branch cutting and pruning tasks quite a breeze. They are lightweight and low maintenance – they usually have an automatic oiler and are easy to use. Each of the above-listed products would make excellent choices. 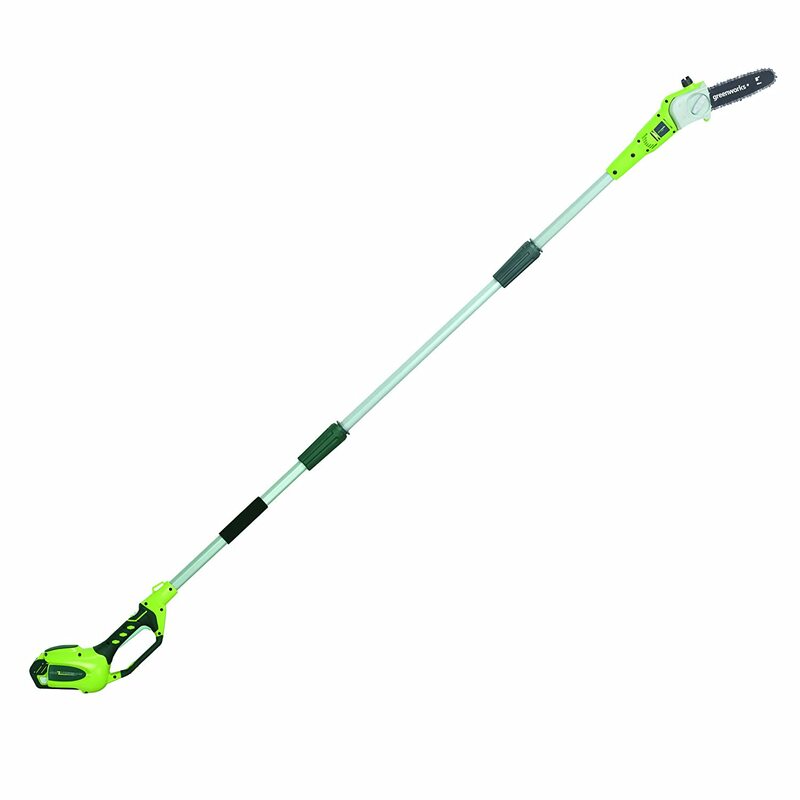 However, our top pick remains Greenworks 8-Inch 40V Cordless Pole Saw. At only 8lbs, the pole saw is lightweight and comes with an automatic oiler making your task easier. The three-piece extendable aluminum shaft makes your reach much more comfortable. With this product, you are pretty much sorted when it comes to dealing with those pesky branches blocking your morning view through the window.